It is the best software if you want to send for 4k-5k bulk whatsapp message daily. It is the best software I have ever seen, able to send 4k-5k messages within 2 hour so very helpful and time managing software. The only problem is whatsapp might ban your number, so please use carefully. It is very useful to ping offers to your subscribers and well new to reach new customers. What Mobile Marketing solution do you use? Branch is a tool that provides deep linking solution for brands to create an optimized mobile user experience that drives app growth, conversions, user engagement and retention, app content becomes searchable, discoverable shareable, and easy to integrate into any marketing channels like email, SEO, social media, and paid SEM. Braze (formerly Appboy) is built for today’s on-demand, always-connected customers. We replace decades-old databases and poorly integrated internal and external tools with live views of every customer, highly intuitive customer journey building, in-the-moment campaign optimization, and more. AppsFlyer is the market leader in mobile advertising attribution & analytics, helping marketers to pinpoint their targeting, optimize their ad spend and boost their ROI. MightySignal is a mobile app intelligence that provides up to date and accurate data on which SDKs iOS and Android apps are using. Mobile marketing solutions across all major mobile platforms. Improve customer engagement with push notifications, location-based marketing, and analytics. Leanplum is a fully integrated optimization solution for mobile apps. The company enables developers, product managers and marketers to unleash the value of customer data by easily optimizing mobile content and messaging via flexible A/B testing, marketing automation and powerful analytics. 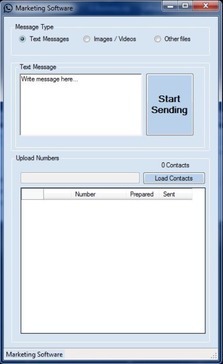 Automatically gather people's name and email via SMS. Get thousands of volunteers all over the country talk to your supporters using phone banking. Remind your supporters about election dates and to go out to vote using voice broadcasting. Sophisticated software for the biggest political parties, yet simple enough for a cause! The only solution that smoothly integrates with your CRM. Reach right people at the right time with the right message. Mozeo lets you create and send text and email messages in one easy-to-use online dashboard and communicate to your customers anytime, anywhere. Vibes is a cloud-based mobile marketing platform that arms brands with intuitive tools to engage consumers across multiple communication channels. Whether you're a sophisticated advertiser, running an agency or ad network, or just getting started, TUNE creates technology to support you and grow your business. * We monitor all WappBlaster reviews to prevent fraudulent reviews and keep review quality high. We do not post reviews by company employees or direct competitors. Validated reviews require the user to submit a screenshot of the product containing their user ID, in order to verify a user is an actual user of the product. Hi there! Are you looking to implement a solution like WappBlaster?